Sterling Campbell was the drummer for British rock star David Bowie. He started drumming in his childhood days, and became famous at a young age. In those early years, he lived an unrestrained lifestyle, including many unhealthy addictions all too common in the rock ‘n roll world. Then, in the mid ‘90s, he was introduced to a cultivation practice from the East and it changed his life forever. Sterling Campbell was born in 1964 in New York City. During his childhood, he was obsessed with music and drumming. “I have been playing drums all my life, since 12 years old. Drumming has become a part of me,” said Campbell. In 1986, barely in his 20’s, Campbell got his first big break and was hired to go on tour with Cyndi Lauper. She was at the height of her career, and at that point, Campbell had never even been on an airplane. From there, his own career skyrocketed. He went on to work with many top bands, including Duran Duran, Soul Asylum, and The B-52’s. In particular, Campbell is known for playing with David Bowie, starting in 1992 and then for the next 14 years. Sadly, David Bowie passed away in January 2016. “People always want to put on some things. I want to put some positive things on my drum and tell people what kind of person I am,” said Campbell. 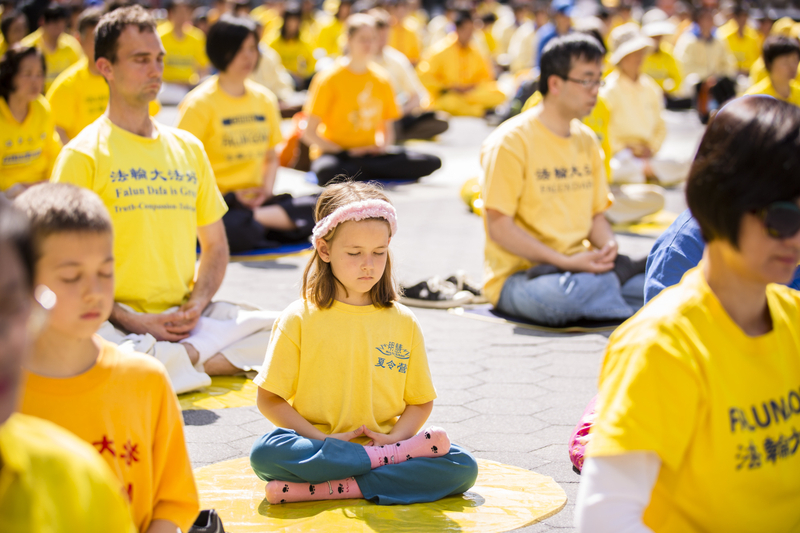 Truthfulness, compassion, and tolerance are the principles of the ancient Chinese meditation practice of Falun Dafa (also known as Falun Gong). One day in 1998, Campbell was walking through Riverside Park on the West Side of New York City, when he passed a group of people doing some exercises. “I saw some people practicing Falun Gong from the side view of my eyes, and I went over,” recalled Campbell. Zhuan Falun is the main book of Falun Gong and has been translated into over 40 languages, including English. Indeed, it is one of the most translated Chinese books in the world, even surpassing Lao Tzu’s “Tao Te Ching,” the foundational book of Taoism. When Campbell read the book for the first time, he said he had a special feeling. Campbell said that before practicing Falun Gong, he had a lot of bad habits that troubled him for a long time. 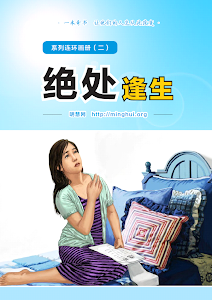 Just like many Falun Gong practitioners, after Campbell started practicing, his life changed dramatically and the bad habits simply disappeared. “I had tried to stop these and I wasn’t able to. Two weeks after I started practicing Falun Gong, I found that I no longer wanted to smoke, drink, or take drugs,” he explained. Campbell said practicing Falun Gong has been part of his life ever since. It is now almost 20 years. Sterling Campbell has been David Bowie’s drummer for the past ten years and he is currently part of Bowie’s Reality Tour, which plays the SECC in Glasgow tonight. 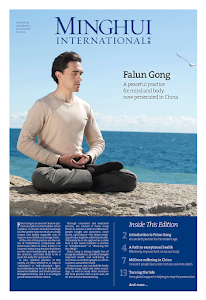 An exponent of the ancient Chinese practice of Falun Gong, New Yorker Sterling was arrested and jailed in China for voicing his support for the discipline, which has been banned by the Communist government. Q: First of all, Falun Gong. Explain. A: It’s an ancient Chinese practice of meditation and exercise. It can be of great benefit to a person’s health and state of mind. Q: How did you get into it and what has it done for you? A: I saw people doing the exercises one day in Riverside Park in New York and became interested. After taking it up I stopped smoking, drinking and drugs within three weeks. I just didn’t do it anymore. I’ve raised my standards as a person – you learn to consider others before yourself. It’s completely about your heart. Q: Sounds good, what’s the problem? A: It became massively popular throughout the 1990s, until at one point an estimated 70 to 100 million people were practicing it daily in China. The Communist government began to have a problem with such a large group of people believing in something and so in July 1999 made it illegal. It claimed Falun Gong was anti-government and anti-Chinese. A: Brutality and oppression on a grand scale. Hundreds of thousands of people have been arrested, beaten and persecuted. Some have been sent to lunatic asylums. 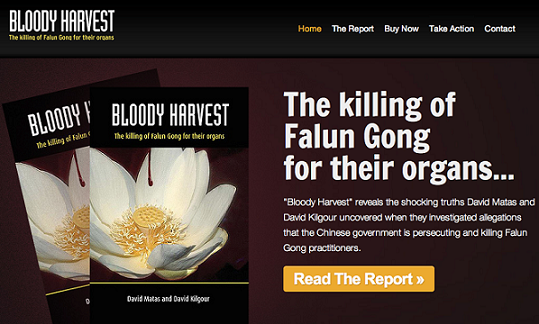 It is estimated that at least 800 people have been killed for practicing Falun Gong. Q: So how did you get arrested? A: I was among a group of 60 or 70 people who went to China in February 2002 to make a stand. We wanted to tell people that Falun Gong is not a bad practice and we headed for Tiananmen Square because it’s symbolic and many people used to practice Falun Gong there. The police were waiting for us. They grabbed us and took us to the police station where we were met with brutality. A: When I got beaten down I didn’t get angry at the person. 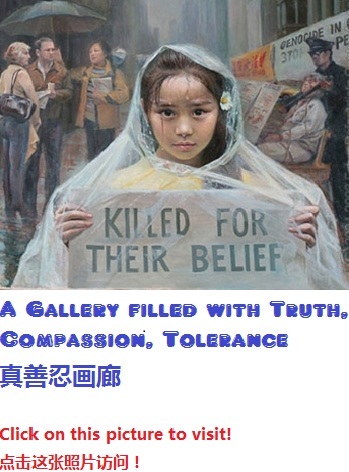 I tried to live by the principles of Falun Gong, which are truthfulness, compassion and tolerance. But the last thing I ever thought I’d be doing with my life is ending up in prison in China – I’m a musician! It was surreal, like being in water faced with a great white shark. One cop was writing me messages on his phone saying: “My president is a bad man.” It’s crazy, it’s like George Bush banning yoga. A: We were expelled from the country. Q: What does David make of all this? A: He’s very supportive. At all the concerts we have information booths about Falun Gong, to raise awareness about what’s happening. Q: And what about your own performance, has Falun Gong helped with that? A: I’ve improved actually. It’s made me a better musician. I give more to David’s music now, I’m more selfless. I have to admit that before I was really good at bringing the attention to me. It’s all about improvement and growth and bettering myself as a person. Every time David Bowie held a concert, Sterling would arrange a booth for Friends of Falun Gong at the entrance of the concert. He would have interviews with media to tell his experience of being arrested in China for supporting Falun Gong. David Bowie, a supporter of Amnesty International himself, has been very supportive of Sterling’s efforts. (Clearwisdom.net) On February 5, 2004, Falun Gong practitioners from the cities of Tucson and Phoenix in the state of Arizona, took the opportunity of David Bowie’s concert tour date in Phoenix to tell people about the persecution of Falun Gong in China by Jiang’s regime. David Bowie, a famous British rock’n’roll star, is giving a concert tour around the world. His drummer, Sterling Campbell, who has worked with other famous bands, has been a Falun Gong practitioner for six years. Sterling and about sixty other western Falun Gong practitioners gathered at Tiananmen Square and unfolded a banner saying “Falun Dafa Is Great” in the year of 2001. Local Falun Gong practitioners took this opportunity to tell music fans about the persecution of Falun Gong practitioners in China and the detention of Charles Li. Many people got flyers and signed their names to support the rescue of Charles Li. Some people joined Friends of Falun Gong. Some stopped by to ask more details. They were shocked by the situation in China and Charles’ experience. Many music fans were curious about the Chinese words “Truthfulness, Compassion, Forbearance” written on Sterling’s drum. They were eager to find out the story behind these words.